Released in 1980 To All a Goodnight and was directed by David Hess best known as Krug in Wes Craven’s classic Last House on the Left and this also marked his directorial debut; To All a Goodnight was one of the first of the wave of slasher flicks that would dominate the decade and with so many of these films produced some were lost in the shuffle and To All a Goodnight was one of those as it’s a seldom seen movie and quite rare. Upon first look this is the typical slasher flick released in the 80s after the success of John Carpenter’s Halloween and you wouldn’t be wrong; however To All a Goodnight was released in January of 1980 and actually was released prior to such movies as Prom Night and Friday the 13th and the setting for the movie also would be very common throughout the 80s though the setting here is sort of the same as Black Christmas. Quite honestly I wouldn’t rate To All a Goodnight as one of the best slasher flicks of the 80s, but I think the movie deserves more recognition than it gets. If anything this movie owes a little more to Black Christmas than Halloween and while this movie is very much your standard 80s slasher flick again it came out prior to many of the more well-known slasher flicks of the 80s. To All a Goodnight also features a killer in a Santa suit, but Silent Night, Deadly Night is the one best known for that and it’s also kinda funny how no one bats an eye with this movie, but Silent Night, Deadly Night caused a public outrage, which lead to the movie being pulled after only 2-weeks. 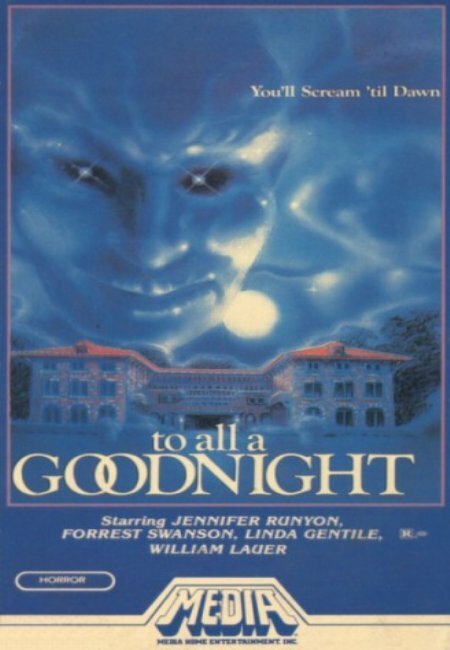 The plot for To All a Goodnight is fairly simple; the setting in an all-girls school where the girls are planning a party during Christmas break, but before the fun can begin a killer wearing a Santa Claus outfit shows up and begins to dispatch the girls and their friends and can all this have something to do with a girl that accidently killed a while back? The screenplay by Alex Rebar features weak characters that are one-dimensional, which is very common in slasher flicks, but the biggest problem is all the characters are inter-changeable for the most part; the main goal for all the women are to get laid, which is kinda cool since it’s always the guys that are like that. All the characters are your standard slasher movie characters, but as I stated earlier this movie has many of those beat by as little as a few months or a couple of years. 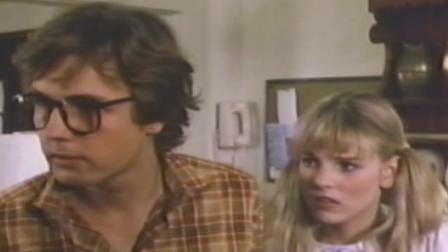 None of the characters are very likeable with the exception of Nancy (Runyon) who I guess is the Laurie Strode of the movie. The characters are also rather stupid even for slasher flick standards. When all their friends end up missing nobody seems to be very concerned chalking it up to they just went home and even after a dead body is found they still have no concerns about their friends or themselves for that matter and while slasher flicks often feature idiotic characters, but this bunch are just total idiots. With that said the screenplay does serve its purpose and while the characters might be shallow idiots they are also a bit fun. As director David Hess does fairly well for the most part, but the pacing can be a bit sluggish at times despite the high body count and while the setting of the movie has all the makings of eerie atmosphere it does sort of lack that feel that many early 80s slasher flicks had going for them. There isn’t a lot of energy in many of the scenes and thus it can drag from time to time, but Hess does manage to deliver some decent suspense as well as a solid final act. This may not go down as one of the best directed 80s slasher flicks, but despite the flaws David Hess mostly delivers an entertaining flick and while this movie went unnoticed by many it did help set the stage for these films. There are moments where To All a Goodnight reminds me of Friday the 13th and there is even a character called Weird Ralph who warns people of pending danger, but based on the release dates for both movies this is just pure coincidence, but that’s why I say To All a Goodnight has a little more going for it than people might realize since it has a lot of the clichés in a type of movie that was still in the very early stages. Of course Black Christmas is probably the ultimate Christmas themed slasher flick and these movies were fairly common in the 80s, but again To All a Goodnight has them beat by a few years and as I mentioned before this movie has the killer in a Santa suit made famous by Silent Night, Deadly Night. Overall To All a Goodnight is a fairly decent entry in the slasher flick and it’s a bit hard to rate since the copy I saw was at times out of sync and very poor quality, but even with that there is still fun to be had. It might lack the energy of many early 80s slasher flicks, but it does manage some decent suspense and tension at times and even though it isn’t one of the best of the 80s slasher flicks it does deserve more of a following.